The Lizard in Raimi’s Spider-Man 4? 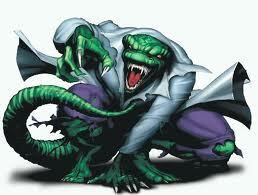 Back when Sam Raimi was helming the Spider-man franchise, events were building up for the next villain: The Lizard. Spider-Man 4 needed a visual villain. He’d already had villains who could soar through the air and turn to sand. So the next villain needed to be good for action movies: awesome looking, fast, and like nothing we’d seen before. Instead of flipping through the air, the Lizard keeps the fight somewhat terrestrial – scaling skyscrapers and leaping car to car on a crowded road. What if the serum Curt Connors uses is successful – at first. So successful, in fact, that he shares his creation with the world. Amputees from all over the world come, and he “cures” them all. Until, later, when the curse seeps in and Connors – and all of his patients – turn into lizards. I thought that the Lizard by himself would not be a good enough villain after Spidey’s already fought goblins and Venom. But a legion of lizards, some of which with special powers, that gets interesting. And, of course, Peter and MJ move closer in their relationship, Aunt May needs her medicine, and Spidey has to use his brains for a change. Peter has taken on a job teaching high school science at a really troubled school. No one will teach there. They’re too afraid. That’s how he was able to get a job without a teaching degree. As luck would have it, the gym teacher there is none other than Flash Thompson. Their rivalry begins anew. All the hype and buzz about Spider-Man 5 should revolve around the new villain, Hobgoblin, and how he is connected to the Osborn legacy. There should also be a note on IMDB or something where he teams up with Shocker. But when you’re watching the movie, there’s this intricate plot involving people you don’t know. Later, when Spidey tracks the Hobgoblin down, he is in league with Shocker, Stunner, Vulture, Hydro-Man, and the Jackal. During the fight with the new Sinister Six, Spidey starts to realize that his spider-sense isn’t going off. In fact, nothing seems to be really happening in the fight. It’s then that Spidey realizes all these people are illusions. He leaves and tries to find what’s really happening. This was all to distract him from Mysterio’s (“Miss Cheerio?”) ultimate plan, which involved all the subplot stuff in the beginning that seemed unnecessary at the time. Spider-Man can defeat supervillains and criminals, but can he win the fights that really matter? Aunt May tells him that he has to fight to make a relationship work. But May has her own fight. She develops a rare blood disease. It’s made worse by Peter spending so much time as Spider-Man that he misses picking up her medication in time. On her hospital bed, May tells Peter that she knew he was Spider-Man this whole time, and that he should be proud of who he is. She gives him the inspiration to do what has to be done. Peter drops everything to be with MJ, helping her get her career back on track. It’s still a rocky road, but he’s going to put her first. Instead of Spider-Man having to beat up a super villain to save someone’s life, Peter Parker goes into a lab to save his aunt’s life. He works beside his professor, Dr. Curt Connors. However, Connors has discovered a way to grow his arm back using lizard DNA. The procedure is a success as far as Connors is concerned, because he doesn’t remember the times he blacks out and becomes the Lizard. He holds a press conference advertising his procedure and he is mobbed by amputees wanting his help. Before long, New York is crawling with dozens of lizards, all of which are controlled by the first and most powerful one. Each henchman lizard has slightly different powers, like spitting venom, chameleon scales, and even wings stretching from their arms to their hips. Peter tells Connors what he’s been turning into. Together, they perfect a serum that will not only save Aunt May’s life, but also keep Connors from turning. There’s a problem: If Connors takes the serum as the Lizard, he will stay as the Lizard forever. 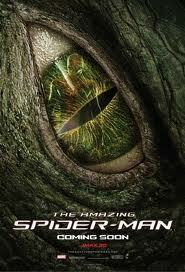 Just as Pete is about to take the serum to Aunt May, Connors changes into the Lizard and steals it from him. Spider-Man battles the Lizard in a lab he built in the sewer, scientific equipment falling all around him. As Spidey forces the Lizard to flee, a huge piece of equipment pins him in rapidly rising water, the serum just out of reach. Summoning all his courage and turning it to strength, Spider-Man slowly lifts the heavy machinery off his back. He saves May but the Lizard is still at large, and making more mutants. Their final showdown begins at the Connors’ home, and spills into the streets. They fight while leaping on moving trucks and a car carrier careening out of control. Mary Jane gets to play the hero. She tricks the Lizard during the final fight, saving Spider-Man’s life. Earlier, when May collapses at home, she’s the one who gets her to the hospital. Journalists and photographers swarm a courtroom as aging mafioso Silvio Manfredi is being escorted to prison. There’s high security and the police are very anxious. The camera sweeps across the row of photographers, including Peter Parker. It ends on one of them pulling a gun. Sweeping back, Peter’s gone. One of the photogs near him is looking around wondering where he went. The photographer with a gun, a dirty cop, and several other people nearby have been planted by Manfredi (Silvermane) to enable his escape. The bad guys pull guns, and they are immediately stuck with webs. Spidey swoops in to save the day. We see his camera webbed up in an inconspicuous place on an auto-timer. We see through the viewfinder as Spidey takes out armed thugs. At one funny point, one of the thugs isn’t coming into frame, so Spidey has to taunt him closer. He doesn’t take the bait, so Spider-Man slings a web at him and pulls him to his fist. Photo finish! He hands the photos in to J. Jonah Jameson, who complains that they are already late. “It’s old news, Parker!” Other photographers already got the shots in to their editors. The TV news people are broadcasting it. Photos are online. Peter said if there was some way to send him the photos, instead of riding his moped in, the Bugle would beat out the competitors. Robbie Robertson suggests giving him one of those Blackberry kind of devices so Peter can send him photos. Jameson grudgingly agrees, with the caveat that the cost of the device comes out of his pay. Peter leaves the Bugle and hops on his moped to get to his advanced biology class at Empire State University. When he arrives, he sees a note on the door signed by Dr. Curt Connors that class has been canceled. He leaves, disappointed. On his way out, he spies Connors looking over photos in his office. Wedding pictures. Shots with his wife, Martha and son, Billy. Peter has a close relationship with his professor and advisor so he goes in to talk to him. Connors is upset that ever since the accident where he lost his arm, he hasn’t been able to really hug his son. He doesn’t feel like a total person. Peter doesn’t really know what to say, but tells him that in the four years he’s known him, he’s respected and admired him. A son wants more from a father than just hugs. He wants to learn from him; he wants his father to show him the world. We get the feeling that Connors is kind of a surrogate father figure to Pete during his college years. Connors thanks him for the pick-me-up. Peter has to leave, because he’s got a big event that night. He’s going to a movie. Open on a big movie premiere. Flashbulbs going off, celebrities walking around. The movie poster shows three characters, one man and two women. One of the women is Mary Jane Watson. It’s for a cheesy-looking super hero movie. A bunch of photographers gather around a limo pulling up to the premiere. The limo door opens, and, although we are expecting to see Mary Jane, the other woman from the poster comes out of the limo. And on her arm is…Johnny Storm? Just a way to tie all the comic movies together. A klutzy photographer bumps his arm and spills a drink onto him. We see the klutz is, of course, Peter Parker. Johnny admonishes him for spilling the drink, but not too harshly, because he can dry himself off quickly. Peter watches Johnny and the actress walk off when another car pulls up. He turns, and brings the camera up. Mary Jane emerges from the car. She poses for a bunch of photogs, then makes her way up the red carpet. The photogs swarm the next car, which is bringing the male star of the movie. So MJ has a minute to play to Peter’s camera and make sure he gets the best pictures. We see through his lens as he fires off a roll on her smile. Then, she stretches out her arm. He settles the camera on his chest and takes her hand, and they walk into the premiere together. The movie is a hit. We watch a bit of it. It’s full of in-jokes made for a group of people who are watching Spider-Man 4. Maybe there’s a scene where Bruce Campbell saunters out of the classic Delta Royale. Peter has to leave partway through the movie in order to e-mail the photos to Jameson to make deadline. While outside, his spider-sense goes off. He sees a woman walking alone down an alley across from the theater. She’s attacked by some kind of lizard man in the shadows. It’s too dark to see much more than silhouettes. The woman is recognized later as Martha Connors, wife of Curt Connors. Spider-Man and the Lizard seem equally matched for strength and speed. But the Lizard is just an animal at this point. They fight leaping between fire escapes on opposite sides of an alley. The Lizard pulls one fire escape off the side of the wall and flings it around with Spider-Man on top. Spidey manages to fling the beast off a building. It connects with a power cable which severs its leg off. We watch as the leg grows back, and the Lizard scampers off into the night. Spidey misses this detail, however, since he was busy making sure Martha Connors is all right. Throughout the fight, Mary Jane is sitting in the theater, looking at the door every time someone opens it. It’s never Peter. And eventually, she stops looking back when the door opens. After the premiere, everyone is coupled off. She has to fake smiles to photographers. She’s none too happy when Peter finally comes back. He hastily explains what happened. He’s humble, so he doesn’t mention it was a big monster. She’s understanding, but is still upset. A lot goes unsaid. MJ and Peter leave the theater, and Mary Jane gives the other actress in the movie a big hug. After they leave, MJ talks about how much she hates the backstabbing attention-seeker. After the premiere, Pete takes her to the side of a building. They both look around to make sure no one sees them. He slings a web up to the top and wraps an arm around her. He pulls them up and the next thing we see they are on a rooftop overlooking the city. He has a small picnic-style meal spread out. She’s impressed. During the meal, he pulls out the ring he never got to use before (given to him by Aunt May in the previous movie). As he’s proposing, her entire demeanor sours. She begins to tell him no. “You’re not acting, are you?” he says, knowing the answer. He leaves, and goes straight to Aunt May’s house. When she anxiously opens the door, he’s got a hangdog face on and she knows what happened. No words pass, she just takes him into a hug. Aunt May and Peter sit and talk about relationships. Peter asks what his parents’ relationship was like. May tells them they were in love, and that’s why they fought. If they didn’t love each other so much, they wouldn’t have cared what happened. The important thing is that he and MJ are fighting because they care, and because deep down they want it to work. They’re fighting to make it work. Aunt May seems very weak during the conversation. Peter promises to pick up her medication for her on his way over the next day. Curt Connors calls him the next day. He needs to see him at his office right away. When Pete gets there, he’s surprised to see he grew his arm back. He wants Peter to go over his calculations again. He must have got something wrong, since he blacked out after administering the serum. He has no recollection of the night before. Connors’ explanation of how he did it is disrupted, and Pete never got a real good glimpse of the Lizard, so he doesn’t put 2 and 2 together yet. Peter warns him he should test the process more, but Connors doesn’t want to wait. Besides, how long can he hide that he grew it back? He’s holding a press conference that day. Connors is about to cancel class again, but instead asks Pete to take over the class for the day. Peter’s really nervous, but agrees to do it. The nerdy student is now on the other side of the desk. It’s a situation ripe with awkward fumbling, where audiences won’t be sure whether to laugh at him or feel bad for him. About half way through the lesson, he gets it. He starts to connect with the other students. It gives him his first taste of teaching. Connors holds a press conference announcing his breakthrough. The Daily Bugle is there. Peter takes photos. Connors is at the height of his game. He appears happy, with his family by his side. But Peter recognizes the worried woman he is with as the woman he saved from the Lizard earlier. Amputees the world over come for Connors’ treatment. Pete gets a good look at one of them, a war vet. (Possibly played by Stan Lee or Bruce Campbell.) Peter can’t get close to Connors to express his concern, because people are mobbing around him. He e-mails his photos to Jonah. On the way to pick up May’s meds, Spidey encounters a different lizard creature. It’s stealing lab equipment from a hospital. This is one in a string of lab break-ins that Jameson and Robbie have been talking about. This lizard has a spiked frill. During the fight, Spidey leaps down from a building feet first to kick the lizard. The lizard with the spiked frill catches him by the feet. As the lizard starts twirling around with Spidey, trying to send him flying, you hear a rip. And Spidey hits the wall. The lizard looks down, confused, as he’s holding Spidey’s pants. Spidey looks down at his costume, which cuts off under the shirt to show his underwear. He flips at the lizard, pushing off the ground with his hands and kicking the lizard. The lizard is shot up in the air (dropping the pants). Spider-Man draws a web between the two buildings and the lizard falls into it. Just then, a mother and two kids are walking past. “Hey, look, it’s Spider-Man!” One kid shouts. The mother turns, and sees Spidey pulling his pants on. Spider-Man looks up at the lizard webbed up, and sees it has changed back into the war vet from Connors’ press conference. Since Peter spent his evening as Spider-Man he misses the chance to pick up May’s meds. The drug shop is closed when he gets there. He feels horrible for failing her. Peter camps out on the steps of the drug store for it to reopen. He’s the first one in, gets the meds, then goes to see May. She looks worse than she did before. He’s apologetic, but she understands. It would almost be easier if she was mad at him, but she’s not. She says he was probably doing something very important, and it’s OK. She says it without any malice, but Peter really felt he deserved to be scolded for it. Once again, Spider-Man interferes with his loved ones’ lives. MJ and Peter meet at the entrance of a cemetery. MJ has flowers. They speak slightly, about everything but their relationship. It’s obvious they are avoiding it. As Peter passes the cemetery caretaker, they address each other by first name. They stop at a tombstone and look down. MJ says, “Happy birthday, Harry.” She bends down and places the flowers at Harry Osborne’s grave. Norman’s is nearby. Connors is in his lab treating an amputee. There are dozens around. He goes into his office to get another batch of the serum that grew his arm back. Spider-Man (not Peter) opens a window and asks him what’s going on, explaining as best he can without revealing his identity, all about the war vet. Connors, very surprised to get a visit from a super hero, explains how he used lizard DNA to augment his own, borrowing the trait of how lizards can regenerate tissue. Connors is mortified by what he’s become. Until now, he didn’t know that he had become a monster. Spider-Man’s story fills in the blanks Connors has been having lately. He wanted to do anything to become normal again, and now he’s become the most abnormal thing in the world. He still has no recollection what happens at night. But all these amputees wanted help, he couldn’t turn them down. And now they’re all turning into lizard men. Connors clears the office of amputees, many of them angry at being turned away. He returns to his lab to work on a cure. Mary Jane gets a call from her aunt, May’s best friend, that she hadn’t heard from May all day, even though they had a lunch date. MJ gives a call to Peter, then heads over to check on her. Peter sees her phone number on his cell. He’s about to answer it but thinks against it. He instead listens to her message the second it goes to voice mail. MJ goes to May’s house, there’s no answer. She peeks in the windows and sees May’s feet sticking out from another room. She’s collapsed. MJ breaks in the door and goes to her. She’s alive, but anemic and confused-talking to Uncle Ben. MJ calls 911. Peter arrives on his moped as the ambulances are surrounding the house. He has an image in his head of how it was when he found Uncle Ben’s body. “Then what are they going to do for me?” Peter has no answer. MJ and Peter sit on opposite sides of May. She’s recovered a great deal mentally now that she’s on an IV. Physically, however, she’s wasting away. “Yeah, I did,” Peter says sheepishly. MJ looks at him, like “Yeah, would you listen to her!” This is the reassuring push Peter needs. Peter goes to Dr. Connors. If anyone can save Aunt May, it’s him. He explains that it’s a progressive blood disease. (We never need to hear this stuff from May’s doctor when we can hear it from the conversation between Peter and Connors.) When Peter approaches Connors, he’s working on a cure to his own plight. He has stopped taking any more amputees, and has gathered a list of the 28 he administered his serum to. He’s been trying to contact them to bring them in and cure them. Despite all this going on, Connors agrees to help Peter’s aunt. He calls a friend at the hospital and gets a blood sample. Peter and Dr. Connors work together to find a cure. Spidey has to put his brain to the test. Here’s Peter Parker saving the day, not Spider-Man. Connors realizes that what May needs is something called Iso-36 (from Amazing Spider-Man #33), an experimental compound that hasn’t been tested outside a laboratory environment. It’s a compound that Connors has been working on, but hasn’t perfected. Connors explains it’s the same compound that could turn him into the Lizard permanently, or cure him completely. There’s a few scenes of the two scientists working in the lab. In between we spend some time with Mary Jane. Even though she was listed third in the credits of this new movie, she has been stealing all the spotlight. She’s hot, and the media (partly because of Peter’s pictures) love her. This causes the lead actress to get jealous and she sabotages MJ’s career by telling horrible stories about her on the talk shows. Her agent drops her, the phone stops ringing, no one returns her calls. Peter sees all this happening but doesn’t have time for her. While working side by side in the lab, Connors starts to realize that Spider-Man and Peter Parker are one in the same. At first, he can’t figure out why he knows this. Then, he starts saying things like, “You two smell the same.” The Lizard persona is gaining strength. Just as they perfect the Iso-36, Connors gradually starts losing control. As the Lizard’s personality starts to infect him, he stops fighting the transformation. Peter fights him in the lab, using his spider-powers, even though he’s not in costume. This time, the Lizard can talk. It says it’s achieving more consciousness. It wants to take over Connors’ weak body permanently. During the fight, the Lizard shows his growing intellect by throwing chemicals at Spider-Man that react violently when combined. Spider-Man gets the Lizard out of the lab so it’s only slightly damaged. On the way out, the Lizard steals the Iso-36 and some of the serum that turned him into the Lizard in the first place. Peter suits up as Spider-Man and gives chase. He sees the Lizard trying to steal a big truck in order to get some speed on Spider-Man. A delivery person was emptying things out of the back. As Spidey approaches, the Lizard looks around. The Lizard sees a man walking around, and calls to him by name. “How’s that new arm working out for you?” Then the man, apparently triggered by the Lizard, shapeshifts into his lizard form and three more lizard monsters pop out of the sewers. Spidey crafts a big web between buildings, with an arrow pointing to the lizards, alerting police. Then, for kicks, he writes “some pig” from Charlotte’s Web. Spidey tracks the Lizard’s truck by following a trail of car accidents from above for a few miles. Then he finds the truck outside the main city heading toward the water, back doors swinging. The Lizard drives the truck into the entrance to a huge sewer drain. We see that the Iso-36 is in the cab with him. The Lizard parks in a lab he’s been building for himself in the sewers. The doors to the back of the truck are still open. Spidey swings in and gives him a kick, sending him flying into the back of the truck. Spidey shuts the doors and webs them shut. The Lizard is pounding away inside, yelling at Spider-Man the whole time. “I’m sorry my mom made me flush you down the toilet,” Spidey says, taunting him. Spider-Man sees that he’s already built somewhat of a lab. Spidey recognizes some of it as belonging to Dr. Octopus. 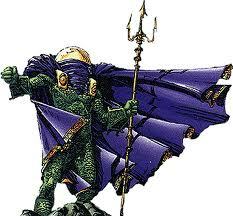 He guesses that after he was defeated, the Lizard ransacked Doc Ock’s watery grave and found some of his equipment. More of it is from the labs that have been broken into recently. He stops having fun when the Lizard manages to bang a small hole in the truck. Spider-Man tries to seal it back up, but the Lizard rips the truck open. They have an amazing fight in the sewers. The Lizard is faster in the water. Water pipes are smashed. Equipment falls down all around them. Spider-Man, already weakened by fighting the Lizard once, then four of his mutant henchmen, is soundly beaten. The Lizard gets the upper hand and tries to administer the Iso-36 to himself. Not only would this make the change permanent, dooming Connors forever, but it would risk Aunt May’s life. Spider-Man, in a last ditch effort, gets the Iso-36 away from him and throws him back into a wall of machines. The lab starts crumbling down around them. The Lizard dives into the water to escape. This is the end of the second act. The Iso-36 falls into the water. Just as Spidey leaps for it, a huge piece of machinery comes crashing down on his back (another nod to Amazing Spider-Man #33). The Iso-36 is just out of reach. Even if he could grab it, he couldn’t lift the machinery off him. He apologizes out loud to May for failing her. And every one else he feels he let down. But no, these people, the ones he loves, would have wanted him to keep fighting. He draws on his love for them to summon strength. In a massive display of courage overcoming all odds, Spider-Man slowly lifts the equipment and tosses it off his back. He wearily grabs the Iso-36 and heads out of the slowly flooding sewers. This teaches Peter he needs to keep fighting, even in a relationship. Just in time, too. He has two options. He could use the Iso-36 to save May or save the Lizard. Peter chooses to save May, and risk the danger of the Lizard causing more chaos. He’s hoping he can recreate the Iso-36 without Connors’ help. Spider-Man gets to the hospital and swings up to Aunt May’s window, not realizing that hospital windows don’t open. Aunt May is a little shaken by his sudden appearance, but tells him “go through the door!” Spidey nods and goes out of sight. He pulls the Iso-36 from his coat and administers it through her IV. May’s readings on the various monitors start to recover. A nurse and a doctor rush in to see why there was such a dramatic change. May tells them the visit from her dear nephew cheered her up. Peter’s hidden all traces of the Iso-36. The doctor tells her he’ll be running some tests, to make sure she’s improving. The cuff of Peter’s Spider-Man costume is showing, so May covers it for him. He goes to Mary Jane. Even with everything going on in Peter’s life, he drops it all to be with her. Again, it’s Peter who makes everything better, not Spider-Man. They meet on a movie set right after she’s been told she’s been dropped from the cast. Perhaps special effects maven Quentin Beck makes a cameo. They hatch a plan together to get her back on track. Peter snaps some very unforgiving photos of the lead actress who sabotaged her career. He happily brings them to Jameson, who is also too happy to expose the teeming underbelly of Hollywood. The photos of her boozing it up and partying with a known criminal destroys her credibility. The criminal is drug dealer Lonnie Thompson Lincoln (Tombstone), who Spider-Man later busts that night (he sells these photos to Jameson, too). Mary Jane’s agent smoothly apologizes, and starts to get her career back on track by getting her spots on the talk shows to tell her side of the story, and plug some new movies. They are smaller roles, but at least it’s work. Spider-Man goes to work in Connors’ old lab to create more Iso-36, in order to save Dr. Connors. The lab, still damaged, is blocked off by the university for security reasons, so he has privacy. Ever since the fight in the sewers, Peter hasn’t seen the Lizard. In a few glimpses, we see the Lizard gathering his forces in some hideout in the destroyed sewer lab. The remaining lizards are there. One is a flying lizard. Another has a long, wicked tongue. The Lizard and his henchmen ransack the county jail to free their brethren who had been incarcerated by Spider-Man. The Lizard makes it a point to tell his henchmen not to kill any of the guards. Instead, he injects them and some human inmates with the serum (Tombstone and Silvermane? ), turning them into lizard people. Mary Jane and Peter have been growing closer again. The magic is rekindled. They’re learning how to make this work. More importantly, they’re not going to stop fighting. They’re out on a date. But it’s disrupted, again, by the Lizard. When Spider-Man gets there, Lizard promises he won’t hurt his son. He just needs a blood sample for a serum that would change him back to Connors. Spidey doesn’t believe him. The Lizard cuts Billy’s face with his claw, and drips the blood into a vial. Spidey pleads with the Connors side of him, never referring to him as the Lizard, and it does seem that he’s getting through a little bit. Enough for him to run out of the home and not put his family in danger any longer. Spidey shoots some webs at him on his way out and the Lizard grabs the webs. Although the Lizard didn’t want to hurt his family, he has no compunction against putting some innocent bystander he doesn’t know in jeopardy. This happens to be Mary Jane, who Spidey told to stay back but didn’t. The Lizard wraps her up with the webs he grabbed. Peter continues to talk Connors down. It’s not working. People in the street are starting to gather around. What we don’t realize right away is that MJ is acting. She feigned being captured. She starts to slip out of the webs. The Connors side of the Lizard starts to come through. He flies into a rage as the Lizard takes over. Spidey can’t hold him back. Mary Jane suddenly pulls on the webbing, which she had pulled between two lamp posts. She trips the Lizard and he falls face-first into a fire hydrant. She actually winds up saving Spidey’s life, as well as members of the Connors family. The Lizard is stunned on the ground, so Spidey has a chance to talk to MJ. The crowd behind is cheering. There’s no more time for fun, though. The Lizard regains his strength. Spider-sense tingles and he grabs MJ and leaps out of the way of the rampaging villain. He deposits Mary Jane somewhere safe just before the Lizard tackles him. The fight turns high-speed when the Lizard chucks Spidey at a passing truck. Spidey flips around and lands on the side of the truck harmlessly. The Lizard follows by jumping onto the side of another truck. They exchange blows, both sideways. They fight by jumping from truck to car to car to truck. All the time, Spider-Man is trying to make sure innocent people aren’t getting hurt. The Lizard sends out a call to his brethren, and as they are speeding through the streets, lizard people are springing out of everywhere. The danger is ratcheted up another notch when the Lizard gets onto a huge car carrier. He throws the driver out and disables the wheel locks so that the cars start rolling out the back. Spidey and Lizard continue their fight, climbing over moving cars on the speeding car carrier. As the cars hit the street, they veer off in various directions. Spidey, while fighting the Lizard, has to use his webs to rein in the drifting cars away from other cars and pedestrians. Spider-Man stands on one car, using webs to pull it one way or another. The car carrier itself is still driverless, and careening out of control. The Lizard is perched on top of the cab. Spidey shoots a ton of webbing between two buildings about a block ahead of the car carrier. Then he creates a strong web on one of the cars that drifted off the car carrier. He pulls with all his might on the web holding the car so that it goes airborne. He pulls it hard, and it flies up in an arc over him. He slams it down onto the Lizard, smashing the cab of the truck. The impact is enough for the car carrier to flip back over front. It lands on its back, most of its momentum halted by the crash. It then slides into the giant web Spidey had made. It grinds harmlessly to a halt. He grabs the unconscious Lizard and swings off toward the Empire University Lab. Legions of lizards are scrambling after him. Inside the lab, Spidey puts the Lizard down and goes for a big vial of the cure he made for him. He draws a syringe of the stuff. Spider-Man injects the Lizard with the cure. In a dramatic finish, he turns back into Dr. Curt Connors, without his new arm. He still hates his old body, but at least now he can go back to his family, if they’ll have him. Spidey fends off the lizards while Connors works furiously inside, filling syringes. There are flying lizards, lizards that spit venom, big crocodile-looking ones, and ones covered in spikes. Spidey draws a web between himself and a lizard on the ground. Then he leaps over a lamp post. As Spider-Man falls down, the lizard is propelled up, until it slams into an overhang. On Spidey’s way down, he webs it to the ceiling. But his fall isn’t over yet. His momentum continues so that he swings under the post and kicks another lizard. He lets go of the strand he was swinging on and flips through the air. Then he fires webs to opposite walls. He stretches back, and slingshots himself into the lizard he kicked before. He can’t keep these acrobatics up forever, though. He starts to get overcome. Just as the lizards start to get the better of Spidey, Connors emerges with a bunch of syringes. With death-defying leaps and twirls, Spidey throws the syringes like darts, attaches some to his webs so he shoots it right into them. One by one, they all turn back. His spider-sense alerts him to the final one, a camouflaging chameleon, who was sneaking up on Connors. He only has enough time to warn him, and Connors turns and sticks the final one. Spider-Man swings Connors back to his family home. They embrace him. Connors says his goodbyes. Spider-Man thanks him for saving May, and Connors thanks Spider-Man for saving him. He misses his arm, still, but that’s nothing compared to the horror he’s been causing. He’s looking forward to having a “normal” life now. Spider-Man sees how his family took him back in, despite the danger he was. He learns that he should let his loved ones get close to him as well. He shouldn’t let himself be lonely. And that he shouldn’t hide the fears and worries he has as Spider-Man from them. He gets a call. It’s MJ. He realizes he left her around here somewhere. Peter comes into May’s hospital room all beat up and sweaty again. May’s getting some rest, dozing off, before they let her go. Peter tells Mary Jane that he’ll never keep parts of his life from her. He understands she’s a big girl and doesn’t have to be shielded from it. Peter notices that MJ is wearing the ring he gave her. When he asks, she says, “Oh, right. I guess I’ll do it the old fashioned way.” She gets down on one knee. She proposes to him, and he accepts. As they kiss, the camera pans back, just enough to show that Aunt May was watching them. She shakes her hands in triumph and whispers “Finally!” They look back, and she pretends to be asleep. He saves the people he loves as Peter Parker. What’s the Lizard’s big plan? To make other people into Lizards and to remain a Lizard himself permanently. Establish that spidey was successful in creating Connors’ cure, show the Connors family grieving while he’s on the loose. Might be a bit anticlimactic, taking out the Lizard before you take out his henchmen? However, there hasn’t been a 30+ mutant fight in the movie as of that point. Nah. It makes it different. It’s a good team-up at the end. Final showdown with the Lizard. Spidey has two syringes. The Lizard doesn’t realize that Spider-Man has already cured his aunt. Spidey tells him that one of the syringes holds the Iso-36 for Aunt May, and the other holds Dr. Connors’ cure. The Lizard gets the upper hand, and demands the Iso-36, which will keep him as the Lizard forever. Spider-Man happily obliges and hands it over. The Lizard gets suspicious. What’s the other vial for, he asks. Spidey says the other one is the cure. The Lizard doesn’t trust him and takes that one instead. The Lizard injects himself and in a dramatic encore turns back into Dr. Curt Connors. The one Spidey had given him was the Iso-36, knowing the Lizard wouldn’t trust him and demand the other one, which was the cure. We need to establish that Dr. Connors only has one arm before the lizard experiment. So that’s why we see him before we see MJ. Aunt May gets sick, or is injured by one of the lizards, and need a blood transfusion. Just like in the comics, Peter’s radiated blood hurts her, and she gets worse really fast. I don’t know about that. Why would Peter risk giving her a blood transfusion. He knows better. He opens the back and it’s empty. He looks around and he sees all the equipment strung up in buildings and trees along the road he took. Peter has taken on a job teaching high school science at a really troubled school. No one will teach there. They’re too afraid. That’s how he was able to get a job without a teaching degree. As luck would have it, the gym teacher there is none other than Flash Thompsen. Their rivalry begins anew. 1. As a famous person coming out of a limo during the premiere. 2. An amputee awaiting Connors’ serum. 1. The lead actor in Mary Jane’s cheesy super hero movie. Possible subplot: Pete is contacted by an attorney. Harry Osborn had no other family, and he left his fortune to Pete. He eventually gives the money to the Markos to cure the daughter and hire Nelson and Murdock to clear Flint’s name. Possible subplot: Silvermane and Tombstone receive Lizard serum in the jail, when the Lizard causes a jailbreak. The story begins when Mary Jane turns down Peter's wedding proposal.